The original version of this review was published in the online magazine Examiner in 2016. Well, it looks like a done deal. On February 28th, Leonardo DiCaprio is poised to get his first Academy Award as Best Actor for The Revenant, specially now that he’s won a Golden Globe for his performance (the film also walked away with Best Picture – Drama and Best Director). Does he deserve so much attention for the role? Probably not. Don’t get me wrong, I think DiCaprio is a good enough actor. I have enjoyed most of his films, and if there’s one thing you can say about him, he has impeccable instincts as to the directors he chooses to work with, from Martin Scorsese to Quentin Tarantino, Christopher Nolan, and Baz Luhrmann. But he’s not a great actor. And that’s fine – not everyone can be. However, the hype machine is currently in overdrive as to the merits of his thespian chops in Alejandro Iñárritu’s survival drama. To which I say, chill out. The Revenant takes place in the America of the early 1800’s and is based on the real-life travails of frontiersman Hugh Glass. Glass is a fur trapper who finds himself fighting for his life when Arikara Native Americans attack and kill most of his hunting party. He’s able to escape with a small group, but soon has to face more suffering as he’s mauled by a grizzly bear (an amazingly realistic sequence), his half-native son Hawk (Forrest Goodluck) is killed in front of him by greedy hunter John Fitzgerald (Tom Hardy), and he’s left for dead in the freezing backcountry. What follows is the story of how he survives – or rather, wills himself back to life – in order to hunt Fitzgerald down and get his revenge. In man-against-nature films it is imperative for the audience to connect emotionally to the main character – to feel the pain he’s going through, to be wholly invested in whether or not he will make it out alive. This, of course, is no easy task. And while DiCaprio is fine, he never reaches that level of empathy you feel when Chuck Noland (Tom Hanks) starts to speak to a volleyball named Wilson in Cast Away (2000), or when Aron Ralston (James Franco) wrestles with the decision to cut off his own arm so he can break free from a boulder in 127 Hours (2010). I think part of the problem may lie in the fact that Glass barely talks (he physically can’t, due to the grizzly wound to his neck), so DiCaprio has to rely on body language alone. That’s very hard to convey, and it doesn’t help that director Iñárritu is more concerned with style over substance, focusing more on technical eye candy – the aforementioned bear attack, long tracking shots, horses falling down cliffs – than on what Glass is feeling. Cinematographer Emmanuel Lubezki shot the film completely with natural light, but as Iñárritu tries to go for the poetic emotional atmosphere of Terrence Malick (Lubezki has repeatedly worked with Malick as well), he mostly lands at overblown. 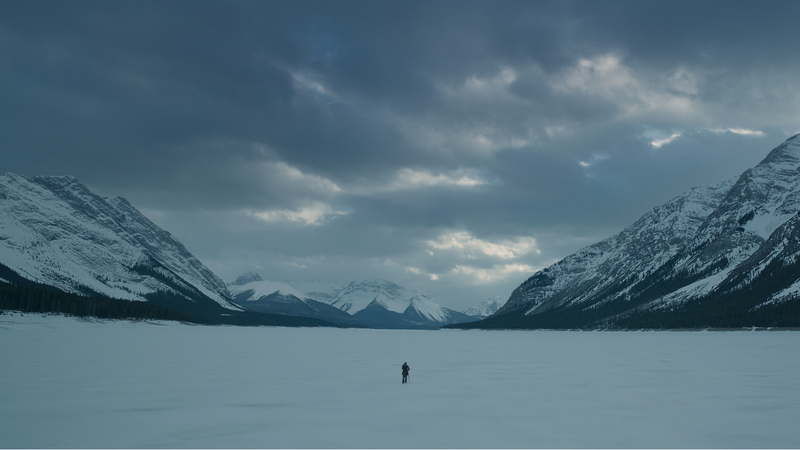 There are some good visuals in The Revenant: Majestic mountain ranges, savage rivers, a herd of bison trying to escape a pack of hungry wolves, white snow coated red with the blood of men. And Tom Hardy once again proves he’s a force to be reckoned with. The moment he walks on-screen and utters his first words, eyes ablaze with wild unpredictability, you can’t take your eyes off him. It’s a high-wire act, and Hardy just nails it. Yet to me, this story of revenge and redemption – of a man rising up from the shadows of death – needed more intimacy and less distance. As for DiCaprio? He’ll most certainly get his gold statuette. But Hardy’s the one who shouldn’t be ignored. Update 2/28/16 – As predicted, Leonardo DiCaprio won Best Actor at the 88th Academy Awards last night.